Guys, I love glitter crafts. I know, it gets everywhere and is a disaster to clean up – but it’s so fun and sparkly! When you add it to fun Valentine’s Day projects, it just brings on a whole happy dimension. 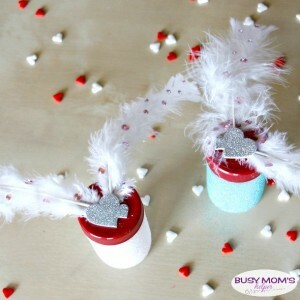 These DIY Glitter Cupid Jars are so cute, and would be perfect gifts or party favors! Despite what you may think, these cupid jars are also super easy to make – and you can customize as you’d like! Choose different colors or stickers, fill the jars with different treats or surprises, just have fun with it. #1: Spray the outside of your jars with the adhesive spray, then sprinkle with glitter so it coats the entire outside. Allow to dry while you work on the lids. #2: Add a few sparkle/jewels to your feathers – don’t make them too heavy, but dress them up a bit. Then use a sticker (or a large adhesive jewel, up to you) to stick 2 decorated feathers onto the top of the lid – like cupid wings! Now just fill with treats, notes, whatever it is you’d like to gift! Easy-peasy, right? I’ll admit, I almost went a little crazy wanted to do adhesive spray and glitter to more things, especially in my craft room. I kept myself under control, but had a BLAST decorating these cute Valentine’s jars!